Have you ever wondered why men take up cycling? I used to think it was because they wanted to stay fit, be sporty, or maybe use a mode of transportation that was better for the environment. But recently I’ve concluded that it’s really about leg shaving and the pursuit of the perfect bag. When brevet season started this summer, Felkerino got really excited. I thought it was because he was looking forward to the group events and putting in some longer miles on the bike. When he gleefully informed me that he was going to shave his legs before the first brevet, I realized that the main reason for all his pre-ride energy was that he got to shave his legs. He defended his leg shaving by saying it was to keep his legs from getting gritty and full of bugs, but I think he just likes feeling those silky smooth cycling legs. Felkerino and me, Harpers Ferry. Shaved legs, all. Recently, Felkerino built up the latest addition to the Dining Room Bike Shop, a Rivendell SimpleOne. The build turned out beautifully, and I could tell after his first test ride that he was in love with the fit and look of this bike. But something was amiss. Felkerino originally affixed an Ostrich bag on the front rack, but after a couple of test rides he decided that the size of the bag did not suit him and he “needed” something else. After Felkerino resolved the quandry of the front bag, he turned his attention to the rear. Suddenly the Berthoud bag was too small. He tried a Carradice, but that was a little too big, not quite right for the SimpleOne. Another Ostrich bag later… now the bags are just right. For now, anyway. Felkerino and the SimpleOne. Something is amiss in the bag universe. All the sturm und drang Felkerino put himself through over a front bag perplexed me, but eventually I concluded that one of the reasons men take up cycling is to buy bags. It allows them to indulge the secret jealousy they harbour regarding all the great purses that surround them. At first the bag-obsessing distressed me, until I realized that I could stroll into the Dining Room Bike Shop and use at least one of them for my own bag needs. I love this marriage! 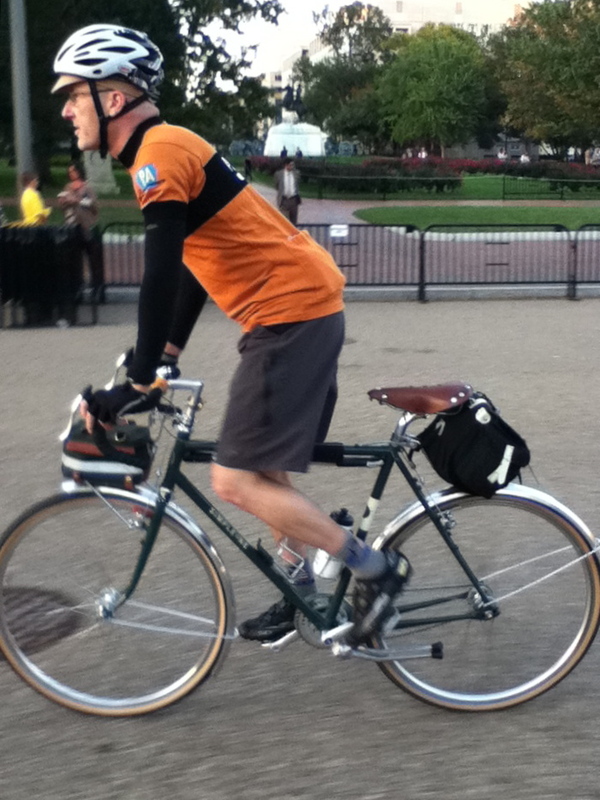 Felkerino isn’t the only leg-shaving, bag-obsessed male cyclist I know. Take a look around. You’ll see. Some men who ride bikes love to shave their legs and obsess about bags. If you call them out about it they are sure to provide another reason for their cycling obsession (getting in shape, going car-free, etc. ), but those are just by-products of the source of their real cycling enjoyment. It’s about the bags and the shaving. 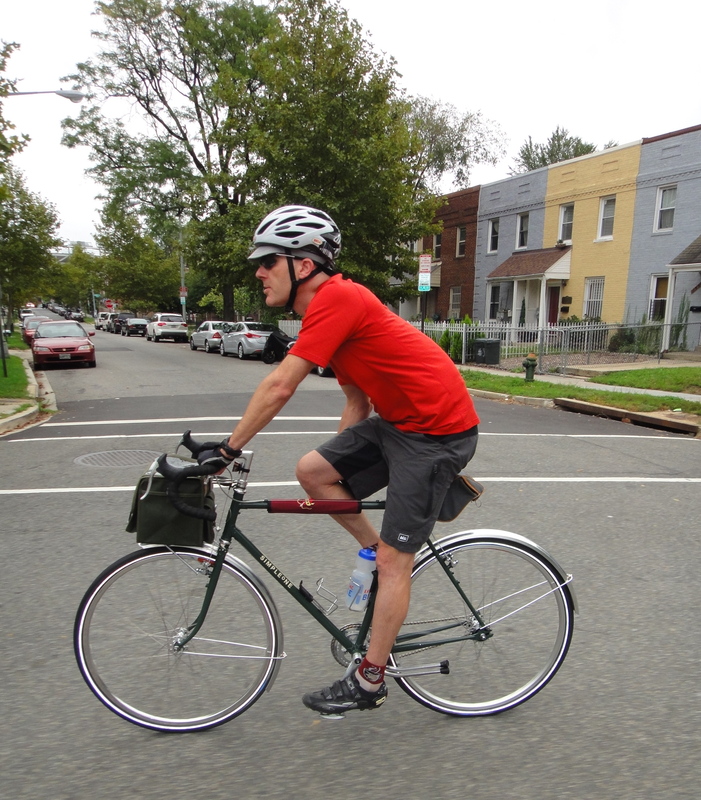 Pay extra attention on your commute or, even better, a brevet start. And, if you are a male cyclist who is reading this blog in between your frenetic Carradice, Sackville, and Acorn bag internet searches, ruing the fact that you won’t need a razor for the winter months, give it some thought. ALMOST spit my coffee out my nose!! For the record, I’ve never shaved my legs. As for the bag thing…. guilty. Ha ha! Glad you liked the post, Mike :). Poor Felkerino. He may end up on the Group W bench. And what’s with all the brake pads? OCD isn’t just for bags anymore. Oh, well, at least, Felkerino likes Elbow. Which, I suppose, begs the question, does he shave his arms too? Yeah, I’m not sure what the brake pads were about. But I will tell you this, I do need some new ones on my Surly LHT so keep it in mind if you see me riding toward you :). Well, the bag just has to be the right color and size. It just has to be. The leg shaving is for the benefit of better massages; it’s easier on the massage therapist as well as the client. Cyclists who want to perform well get regular massages from an experienced, licensed massage therapist so they want it to be as easy as possible. Women have their quest for the perfect bag/purse, so do men. As I started looking at how they are made, I began to think, hmmm, maybe I can make one, so my sister in law bought me a machine for X-mas, from the thrift store for $35, and away I went. Thank you for you blog, I really enjoy reading it and seeing your images. Since we are on the subject, perhaps you can come up with a term for these bag folks, in SF, we call folks who are into fancy groceries and restaurants, “foodies” perhaps we can call bike bag folks “baggies” or “baggers”? It’s a good idea… I will see if there is a potential term! By the way, Ely, I think your bags are great and have enjoyed seeing them on your blog as well as the flickrverse! I did not know it was a $35 sewing machine that got you started… cool! Men shaving legs … I’ve heard various reasons for the last 40 years, including easier cleanup after road rash, aerodynamics, ease in applying sunscreen, etc. Personally I’ve never bothered. Now bags, yes, always the quest for something better. That’s where we are at our house… the neverending bag-quest spiral! As usual MG is very right about this. I’ll admit to the leg shaving — but I have perfectly practical reasons! Sunscreen, cleaning up, blah blah blah. But, I dislike keeping up with it. That’s why I quit around Labor Day. Bags — we are possibly in the Golden Age of Bike Bags. And they are a lot cheaper than a new bike! 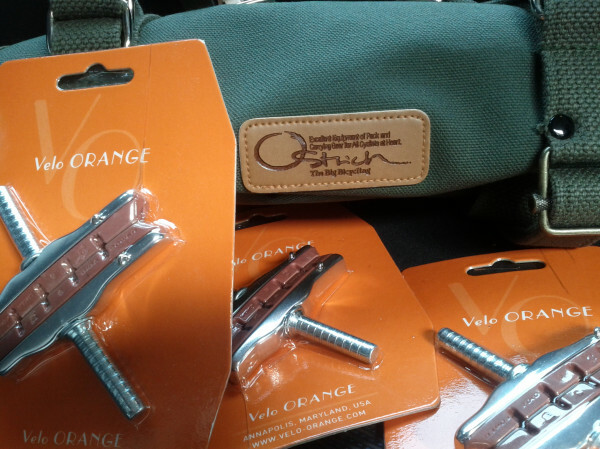 I don’t think I’ll be shaving anytime soon (my beard probably speaks to my inclination to shave on a regular basis) – but I agree with the quest for a good bag (and well, if there was enough money I would be on quests for the perfect bikes too). Right now I don’t think anything would make me happier than my Acorn Boxy Rando bag up front… in the back I am not settled yet on the perfect combination of capacity, appearance, etc. etc. Those Acorn Boxy Randos are so lovely! Shaving has its pros and cons. The perfect bag doesn’t exist. 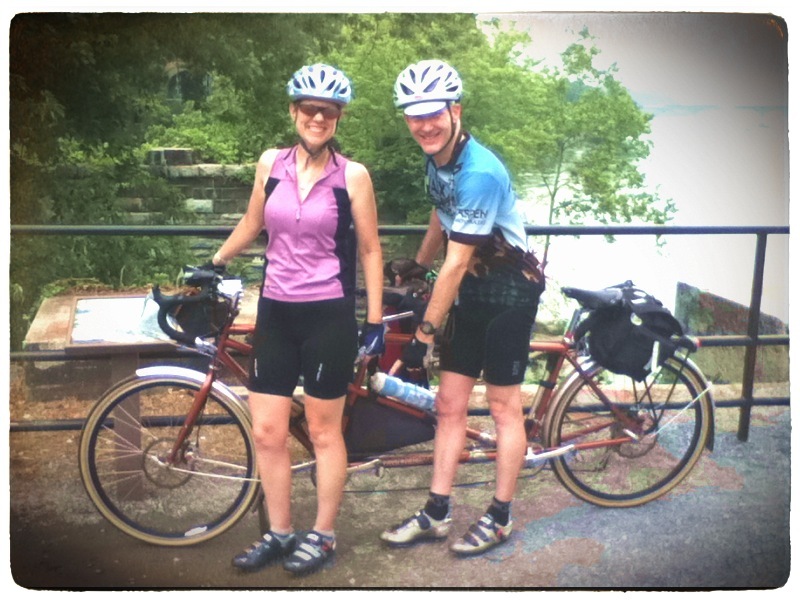 You have to make it and keep modifying it with add-ons as the brevets get longer. Hugs to you MG and all the men that shave down during the season. haha! …sorry if you don’t know me. Yeah, hugs to all the men that shave!! Thanks to everybody for their comments… Oh, and note: this blog does not discriminate between leg-shavers and non-shavers of legs (previously wrote non-leg shavers, but that makes no sense!) :)!! Ride on, my friends.